BOOK COVER: A boy’s image while looking backward raising a hand seems like he is calling his dad. The couple is sat in a boat beside the boy. Flying birds indicate the scene of dawn. An umbrella in a girl’s hand indicates rainy season. Monument in the cover shows that cemetery place is near somewhere. Title 'Hey Dad! Meet My Mom' perfectly suits to the book cover and plot. I would give 5 of 5 to Jimmyeric Films & Media for the cover design of HDM3. Puneet Shrivastava: Authors portray Puneet Shrivastava as a protagonist in HDM3. He is the narrator of the story. Rishi: Authors portray Rishi as the second main character in HDM3. He is a boy of 10 years age. Roshni Bhatt (Rosh): Rosh is a dream girl of Puneet. Mrs. Bina Shrivastava: Authors sketch Bina’s character as the typical mother of Puneet. I am sure that readers would relate their own mother with her character. Mr. Rajiv Shrivastava: Rajiv is the name of Bina’s late husband and Puneet’s father. Dr. Sharad Taneja: Dr. Sharad is Puneet’s uncle and he works as a psychiatrist in his clinic. Maya: She is the owner of her coffee shop. She: She is the mysterious character. You should read the book to know about her. Myra: Authors portray Myra as Puneet’s girlfriend. Mrs. Martha: Puneet’s house owner in Ahmedabad. Yash Agrawal: Puneet’s senior in Computer science engineering and a roommate in Ahmedabad. Umesh: Puneet’s roommate in Engineering in Ahmedabad. Authors portray his character as a complete girls’ database. Hehehe!!! John: Authors portray John as a friend of Puneet’s seniors who has 6 abs with an impressive physique. Rahul: Authors portray Rahul’s character as a Puneet’s senior. He represents guys in institutions who follow senior attitude. Taxi Driver: Authors give a glimpse of a taxi driver in Ahmedabad whose presence is really short in the story, but he represents whole community of his occupation in big cities like Ahmedabad. Baba: Authors portray Baba as an exorcist. Adi, Riya and Kiara: Authors portray their characters as secret in Rosh’s life. Kiara’s name reminds me the central character of 'It Doesn’t Hurt To Be Nice' by Amisha Sethi though there does not exist any kind of relation in between both books. SETTING: - The story of HDM3 is narrated into 22 short chapters. Authors use present tense to narrate the story and flashback scenes are narrated as usual in past tense. Regional words are printed in italic fonts. Short chapters increase the curiosity to finish the book in one go. LOCATIONS: - The story of HDM3 runs around several locations like Puneet’s house, Maya’s coffee shop, Myra’s PG house & Dr. Sharad’s clinic from Delhi and St. Xavier’s College Ahmedabad & Kalapur railway Station from Gujarat. LANGUAGE & WRITING STYLE: Authors scribble the story in simple language and narrative style. Use of capital letters to stress on words and italic fonts for regional words make the book interesting. Every chapter of HDM3 begins with the shadow image of a married family (introduced on the first page) and ends with a graphic image of a little boy. PLOT and SUMMARY: - ‘Hey Dad! Meet My Mom!! !’ begins with a comic conversation. The story is based on Puneet’s daydreaming and nightmares but authors cover so many genres within 157 pages only. Authors don’t stretch the story so every single page becomes worth reading and entertaining. Rishi’s appearance in Puneet’s life commemorates ‘chemical locha’ in the Bollywood movie ‘Lage Raho Munnabhai’ where Munna (Sanjay Dutt) could see Mahatma Gandhi (Dilip Prabhavalkar). Rishi’s character relates a character of the Karna in the novel 'Karna’s Alter Ego' by Surendra Nath Mohanty Ji in which Karna appears in protagonist Vasu’s dreams. Authors refer a quotation from the Mahabharata- “Jurm karne se bada paap jurm sehna hota hai.” Authors inform about Laughing Buddha as “Laughing Buddha is a Feng Shui article. It’s the indicator of good luck or good charm. And there’s a saying that, if you wish for something while touching the stomach of this idol, your wish will get fulfilled soon.” The suspense keeps unrevealed until the end so the book becomes interesting. The twenty-first chapter is one my favorites. A poem ‘Hey Dad! Meet My Mom! !’ by Payal Srivastava is just like a cherry on the cake. DRAWBACKS: - Though there are not too much printing errors in the book, I found two typing errors in it- ‘of which’ is repeated on page 33 and Dr. Sharad Taneja’s surname ‘Taneja’ is written incorrectly as ‘Ahuja’ on page no. 85. Though Rs. 150 are not too much, I think the price of the book is a bit expensive. I know the strategy behind prices of books but I think it would be much better if HDM3 would be available in between Rs. 100 and Rs. 120. I would give 4.4 out of 5 stars to the book ‘Hey Dad! Meet My Mom…’ by Sandeep Sharma and Leepi Agrawal. Right since childhood, the world in which we live teaches us to bury our ‘bad’ past somewhere deep inside us and just move on. So deep, that even we can’t possibly dig it back out. What happens when a 10 year old child, who claims to be your future son, comes to you to help you find his mother, who’s your perfect match? What happens when a girl starts turning your dreams into nightmares? What happens when your ‘future son’ starts haunting you? What happens when your FUTURE starts bleeding into your PRESENT through your PAST? ‘Hey Dad! Meet My Mom!! !” is nothing less than a roller coaster ride of mystery, love, comedy, fear and suspense. So make sure you don’t forget to expect the unexpected!! 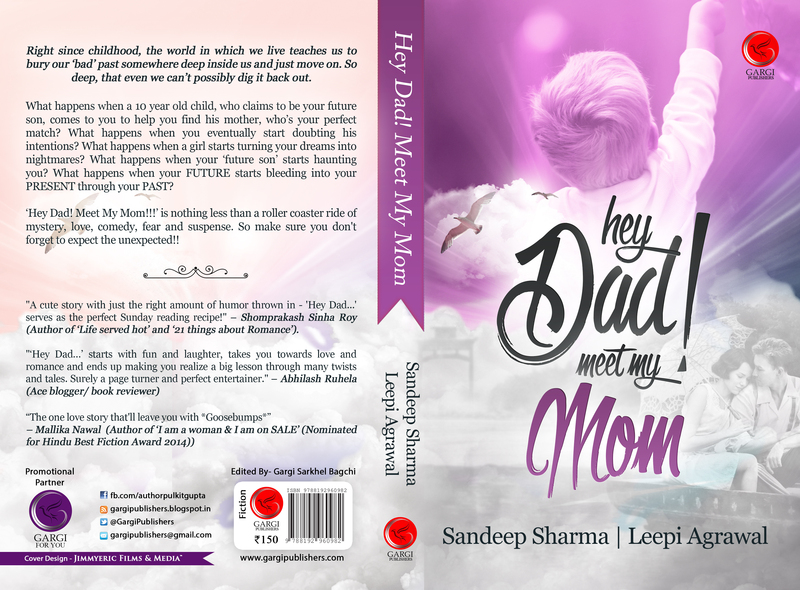 “A cute story with just the right amount of humor thrown in – ‘Hey Dad…’ serves as the perfect Sunday reading recipe” –Shomprakash Sinha Roy (Author of ‘Life served hot’ and ’21 things about Romance’). Sandeep Sharma, a dreamer from Agra, the city of love and the Taj Mahal, is currently in his final year pursuing B.Tech (Civil Engineering) from JSS Academy of Technical Education, Noida. He is very passionate about writing and has been writing short stories for a personal blog since 5 years. He has also co-founded ‘The Author’s Blog’ which is a kind of a platform which tries to bridge the gap between authors and readers. He is an avid reader and loves to review books on his blog. He has been previously associated with many anthologies as a contributing author. It is said that books are a person’s best friend, so Leepi Agrawal started spending her with this special friend who then led her to write stories and poems at an early age. The Times of India gave wing to her writing by publishing her works in their esteemed newspaper. Leepi is an “Ahmadavadi Chokri” filled with zest and always strives to mark her work with perfection. She is a final year student and a gold medalist for her academic excellence in Masters of Computer Applications at Indus University, Ahmedabad. She has won the TechFest in April 2014 at college and state level. As writing is her passion, she loves to roam in the “gallis of Ahmedabad” so that she can explore more about her birthplace through writings. Apart from the previous successes of her short-stories, now even one of her poems has been acclaimed on an international platform. She is quite obsessed with writing, wires and machines and subsequently her obsession has turned into her passion and profession. Today is her birthday, so let’s wish her warm greetings on her birthday. I hope she would like this review as a small gift from her reader on her birthday!! Wishing her a very HAPPY BIRTHDAY..!! Few quotes are mentioned in this review from the book HDM3 with the permission of one of the authors of the book Sandeep Sharma. Reviewer doesn’t claim to be a writer of quotes mentioned in this review. Review Copy of HDM3 was sent to the reviewer by an author Sandeep Sharma. This is my personal opinion and analysis of HDM3 and readers’ reviews may be different about the same book. Reviewer of this book works as the President of Gondia District at Akhil Bhartiya Marathi Sahitya Parishad, Pune. I wrote this book 2 years ago and today when I read this review by Rajesh D. Hajare, he made me go through all the memories of that writing process. He wrote it in such details that I could see each and every emotion that we had while while writing this book. Thank you so much Rajesh for accepting this book and reviewing in such a great depth. You are the most passionate reviewer I have ever seen. You are improving a lot and I wish that you keep on moving ahead on the ladder of success. Very nice analysis. Thank you. i m in love wit ua reviews.